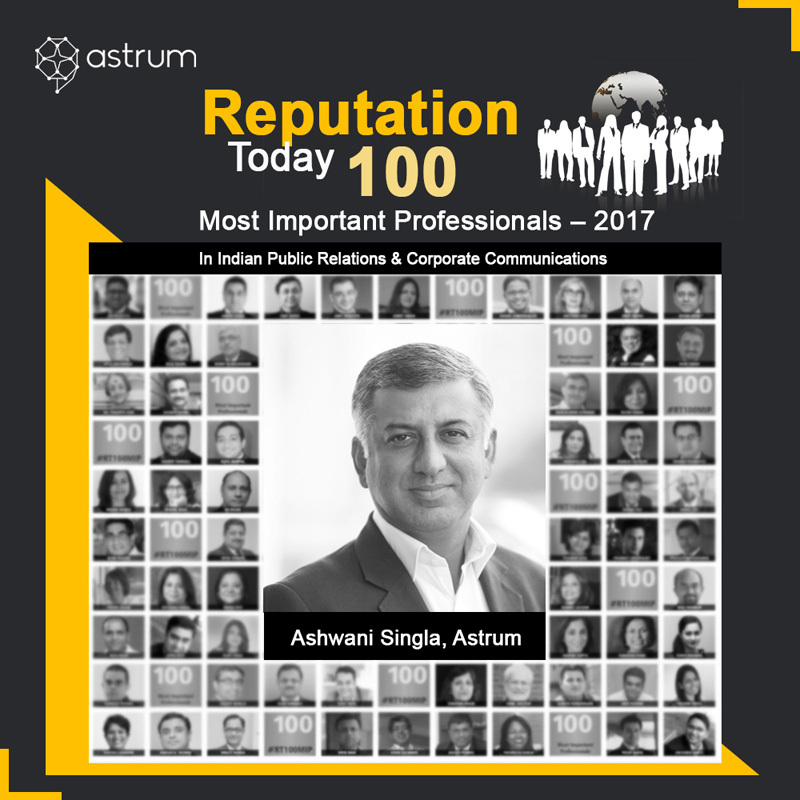 Ashwani Singla, Founding Managing Partner, Astrum has been featured in the Reputation Today, 2017 listing of the “100 most important professionals in the Indian Public Relations & Corporate Communications”. Ashwani, is credited with establishing some of the most cutting-edge industry practices in India. He has previously featured in the Campaign India Magazine’s ‘A list’ and Agency FAQ’s listings of the most influential communication professionals in India. Earlier this year he was inducted by the Public Relations Council of India into their Hall-of-Fame. In his distinguished career of over two decades he has built successful firm Like Genesis Burson-Marsteller and Penn Schoen Berland as their CEO and Asia MD respectively. Renowned for his strategic thinking, he has been a trusted advisor and strategist for both the C-Suite & Political Leaders. He has advised both Indian and Multinational corporations across a range of sectors. Since the 2014 General Election in India, he has been the election campaign strategist for the Bhartiya Janata Party (BJP) and has been involved in several successful domestic and international election campaigns.